> Fully padded with elastic gear strap. > Two internal zipper mesh pockets. > Open flat with adjustable tether straps. > Open top padded sleeve, fits up to 17" laptop. > Exterior over handle sleeve. > Additional zipper sleeve on the outside. - Two padded utility pockets. - Concealment pocket with loop panel for Velcro attachments. 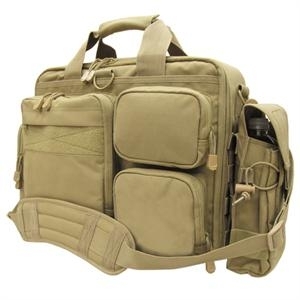 - Reinforced wrap around carrying handle, with padded grip. - Detachable/ Adjustable padded shoulder strap. Color: OD, Black, Tan and ACU.